Spot Cool Stuff is freshly returned from the 2012 International Toy Fair, a huge trade show where games, puzzles, scooters, trinkets, action figures, squirt guns, building blocks, mini robots and all manner of other playthings are put on display—and then taken way too seriously. Here’s our annual roundup of the new toys we spotted at “The Fair” that seemed especially worthy of highlighting. Keep in mind that, at least for this website, Spot Cool Stuff has a bias towards products that adults can enjoy playing with as much as kids; you won’t find any dolls, baby rattles or toddler toys on our list. 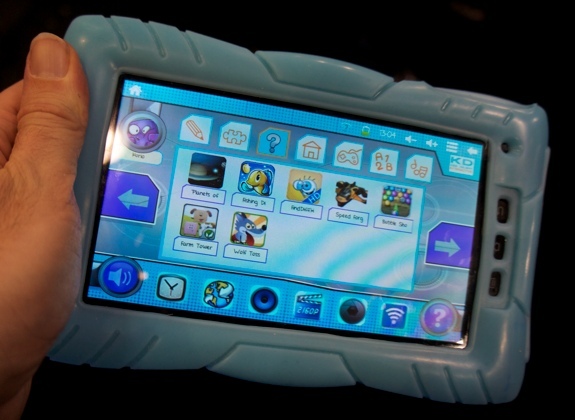 The LeapFrog Explorer won the coveted 2012 Toy of the Year honors. Had been up to Spot Cool Stuff we would picked another kids tablet computer for the award—the Kurio 7. The Kurio runs a full version of Android and does most everything a regular tablet computer can. The cool part: The Kurio also lets parents create customized profiles for each of their kids. Parents control which apps each child is allow to use, which websites they can go to (if any) and even when and for how long they can play. The children, for their part, get a tablet with a bright, easy-to-use interface. Read more about the Kurio on our review of the best tablet comptuers for kids. If you don’t have an 8-year old you might not know about Hexbug Nanos. A Nano is a vibrating cockroach sized thingy that scurries around when turned on. Trust us—they are much more fun than our description makes them sound, especially when they are raced around the loops, ramps and tracks of a Hexbug environment. 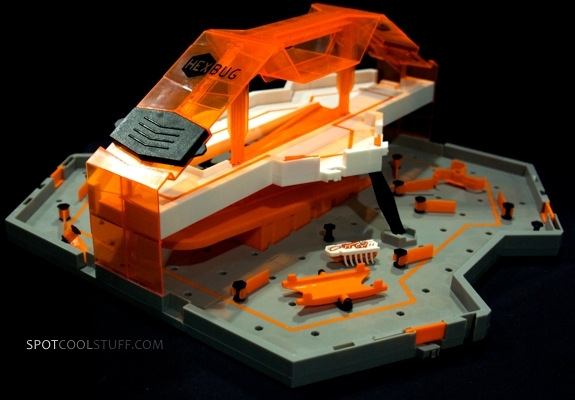 With the launch of the Hexbug Hive, Nanos now have a portable environment to scurry around in. The Hive includes jumps, a ramp and a Nano maze that kids can design themselves. 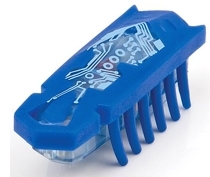 It’s made specifically to be integrated with other Hexbug Nano systems, so you can build tracks (and, coming soon, zip lines) between the Hive and other Hexbug products. When you are done playing, the Hive folds in half for easy storage or portability. Yes, Hot Wheels race cars are still around and still the stuff of children’s playtime. With the new Hot Wheels Wall Tracks, that playtime now goes vertical. Wall Tracks are matchbox car tracks you attach to a wall (go figure) using brackets and low-adhesive tape. Mattel claims the tracks are completely removable, though you are certainly better off using it on a wall that’s been painted as opposed to one covered by old wallpaper. 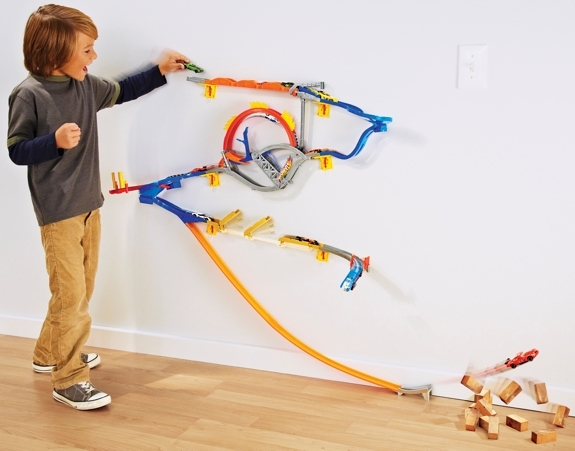 Wall Tracks are sold in various sets that include loops and jumps. All the pieces in all the sets can be mixed, matched and arranged in whatever way your child—or you—can concoct. Price: $31.99 for the starter set. Prices vary for other sets. When we showed Test Tube Aliens to a mother she immediately exclaimed: “It’s so gross looking!” Which is to say, kids will love it! Out of the box, a Test Tune Alien consists of an oversized clear plastic tube with a cocoon inside. Keep the tube filled with water and nourished with “sloog” (a kind of “food” that’s included) and your alien will hatch from the cocoon and then grow to about triple in size. When it is fully developed—a process that takes about 2 weeks—the fledgling alien’s brain will start working. (You know this because an LED light inside the alien’s brain will light up). What’s cool is that growing the alien is not the end of the fun. Each alien comes with a special code which you can type into a special website to “interact” with it. There are various alien characters to choose from (of which Nash is the most popular) and each has its own personality. 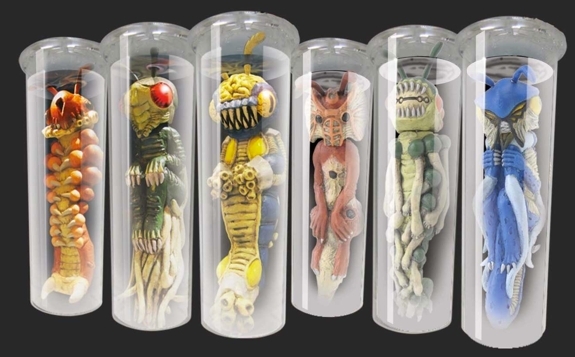 For sale: Six alien characters are available now. Six more are coming in Fall of 2012. In a previous post on appcesories we featured the iCade, a case that turns your iPad into a classic, miniature arcade game machine. 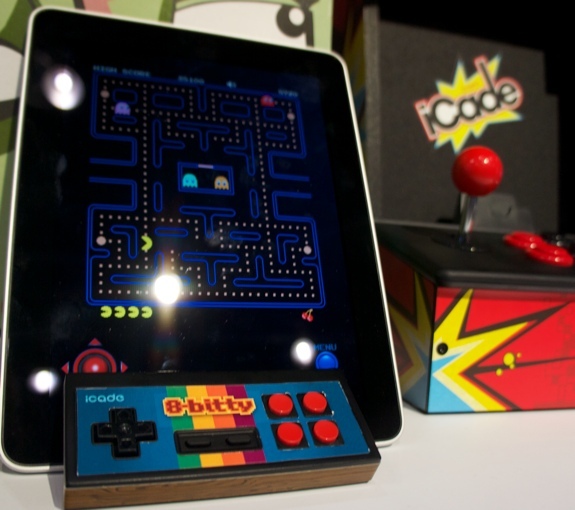 The people behind the iCad, those at the cool and wondrous store Think Geek, are soon coming out with a way to take that iPad arcade feel on the road: the 8-Bitty. It’s a Bluetooth connected controller with classic arcade-style buttons. It will work with most games but it’s especially meant for the arcade classics like Pac Man and Joust. A Loog guitar is that rare toy that immediately exudes quality and has the look and feel of an object that’s built to last. 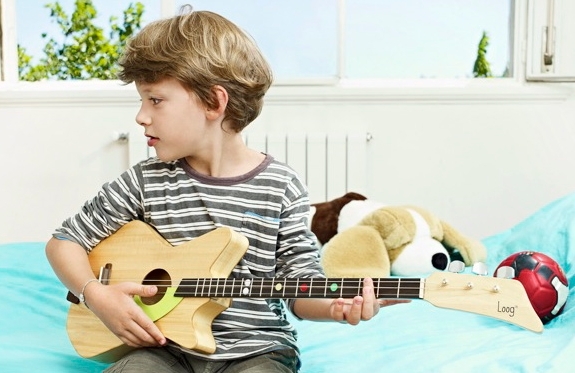 It is not the only kid-oriented guitar on the market, but the other offerings are either “fake” guitars, 6-string student guitars or cheap, plasticy things. A Loog is a real, solid 3-string guitar—any tune that can be played on a regular guitar can be played Loog. It’s just that a Loog is easier to figure out than a 6-string. Color coded cord dots on the neck help with the learning too. This learning friendly guitar combined with a teacher for guitar lessons will ensure that your child will not only learn to play guitar, but love every minute of it. Also cool: The Loog ships in parts. (It takes only 15 minutes to assemble.) 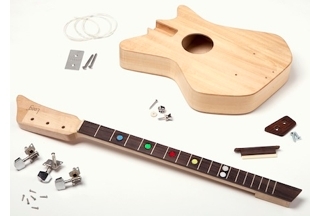 That modular construction makes a Loog an adaptable instrument. Start off with a short-scale neck (recommended for kids ages six to nine) and then move up to a longer neck when your kid is ready. 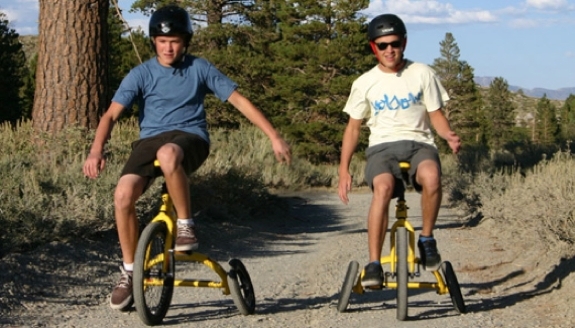 A regular tricycle is like a bicycle with three wheels. A Cyco Cycle is like a unicycle with three wheels. There’s no handle bar. Instead you sit on a banana seat and steer by shifting your weight. When we first tried one out we made a sharp right when we intended to curve gently to the left. After a few minutes, though, we got the hang of it and were racing confidently around the halls of the Toy Fair. A Cyco can also be ridden by standing on the back and pushing yourself along, scooter-like. 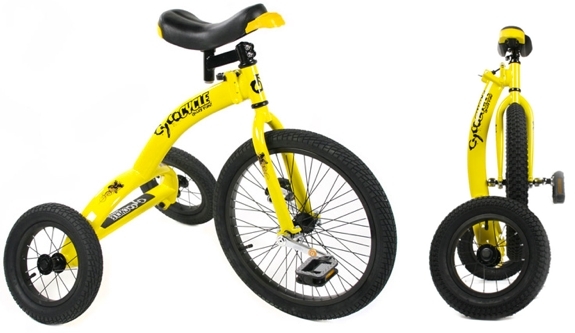 There are two Cyco Cycle models: a regular, for ages ten and up, and a mini, for kids aged seven to ten. Both fold down for easy transport. For sale: The regular Cyco is available now. The Mini Is due out later this year. Remember Jenga? From Melissa & Doug, cool purveyors of children’s playthings, comes the next hit stacking game of manual dexterity—Suspend! 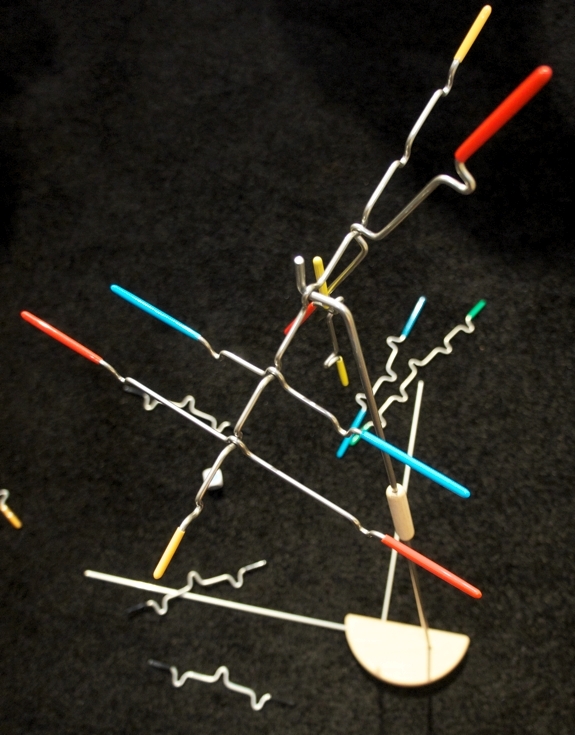 The game consists of a stand and 24 color-coded rubber-tipped wire hanging pieces. Roll the dice and then attach a piece of that color onto a hanging sculpture. With each new piece the balance of the sculpture shifts. Kids will love it. College students will surely turn it into a drinking game. In addition to Suspend! (above), our favorite new family board game we spotted at the Toy Fair was Reverse Charades. It’s very much what the name suggests. Instead of one person acting out a word or phrase for a group to guess, a group acts out a word or phrase for one person to guess. The group must work together quickly yet coordinate without talking. Hilarity ensues. There are two versions of Reverse Charades available: a regular version for players as young as ten~ish and a junior version that is suggested for children six and older. Despite the “junior” in the name, both versions are fun for adults to play sans kids. The exact same game is available in the form of the Reverse Charades iOS app, which is both cheaper and more portable than the physical version. dude the Hot Wheels Wall Tracks is perfect. my son uses these battery operated car “shooter” that have rotating wheels to get the car moving.. the wall tracks are perfect! gravity power baby!